Five presentation were given in Session Block D by Task 56 Experts. As a part of the EC-funded FP7-project iNSPiRe envelope retrofitting packages have been developed. The goal was to improve the façade of these buildings by providing more accessible and affordable energy saving solutions. 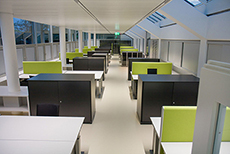 Bartenbach and research partners at Innsbruck University have recently developed a dosimetric model for achieving non-visual light effects during the day as well as a circadian effective artificial light and daylight control scheme. At the moment the suitability of different daylight systems to realize this light control scheme are evaluated. Within the frame of the national research project “Prefabricated façade elements with maximum integrated HVAC components and systems for the renovation of existing buildings” the potential for the intelligent renovation of existing buildings should be shown and new solutions should be developed. 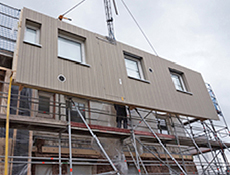 A highest possible level of prefabrication should minimize the required renovation time and avoid vacancy. In particular, the aim is also to find solutions, which allow a direct interaction of the HVAC components in the building façade with the room behind. It is estimated, that there will be a large market for “Active House” building technologies, but also that this depends stromgly on securing an attractive cost level for the implementation. During 2017 results will be obtained from ongoing implementation of active building elements in Nordic Built funded Urban Renewal in Valby and the "Nordic Built Active Roofs and Facades" project dealing with "Ellebo Garden Room renovation" in Ballerup near Copenhagen. 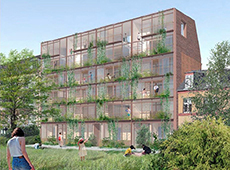 In some cases it is aimed to reach an energy quality equal to the Danish low energy class 2015 for urban renewal of old housing blocks. Over the last few years, a growing attention has been given to the integration of active solar technologies into the building envelope, so to increase the renewable energy production share and contribute to reach the goal of net-zero energy buildings. In this context, the layout of an air based solar cooling system integrated into a façade module was designed and assessed in  . This solution utilizes a triple state absorption module within a Sydney type vacuum tube solar collector to thermally condition an airflow directed to the internal space reducing the thermal load covered by traditional technologies. The objective of the EC-funded project iNSPiRe is to reduce the problem of high-energy consumption of existing buildings by producing systemic renovation packages that can be applied to residential and tertiary buildings. The renovation packages aim to reduce the primary energy consumption of a building to lower than 50 kWh/(m2 a) for ventilation, heating/cooling, domestic hot water and lighting.